Gloom Box is a 2D puzzle-platformer with music-driven gameplay. The protagonist of Gloom Box is a preteen girl named Muse. The game follows Muse as she explores a colorful and musical world, called Opus, aided by her companion, a sentient boombox named, Gloom. 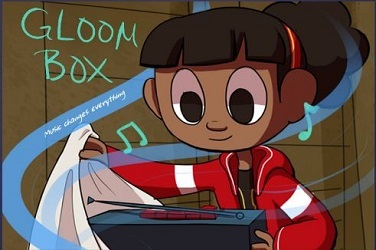 Gloom enables Muse to play cassette tapes that she finds scattered throughout the world. Each cassette tape contains a different genre of music, which corresponds to a unique ability. In Gloom Box, the player is able to affect non-player characters (NPCs), named Clefs and Glisses, and the environment with an array of musical abilities. These abilities can be combined, or "mashed up," with varying results. The end result is a musically-immersive, puzzle-solving experience. Created by Anthony Danger Zalar, Chengchen Yang, Reuben Brenner-Adams, Roger Smith II, and Stein Astor Fernandez for a Master's Capstone project at the Rochester Institute of Technology. Copyright 2017 Pentatonic Games. Arrow keys to load/unload cassette tapes. Space to play currently-loaded cassette tape(s). Down arrow key to stop currently-playing cassette tape(s), or to eject currently-loaded cassette tape(s). R to reset to the last checkpoint. Space to advance through dialogue. I hope Muse will get home one day. :) And that she'll find a few more tapes. Thanks for playing Gloom Box, and glad you enjoyed it! We'll let you know if we post any updates in the future.